Daniel and I have been working on looking more closely at the advertisements from Arkansas and Mississippi digitized in the Documenting Runaway Slaves project. Using regular expressions, we are cleaning up the text files in Text Wrangler to remove unwanted information, such as footnotes, extra dates, and page numbers. Our goal is to find out how many total ads there are for each state, how many ads there are in each particular newspaper, and how many ads there are between the years 1835-1860. Below is our progress divided by state. By using regular expressions to search for individual dates for ads and separate them into individual text files, we were able to identify 457 separate ads for Arkansas. Within this subdivision, searching the years of the groups narrowed down the pool of ads to 324 within the range of 1835-1860. Uploading the text to Voyant Tools, I was able to use the ResoViz tool to identify the different organizations in the ads. This gave a strong pointer towards which newspaper titles occur most frequently within the base of ads. Searching for these in the text in Text Wrangler, I was then able to count how many occurrences there were with the “Find All” feature. This search found 272 occurrences of the Arkansas Gazette. 28 of these were overcounted due to mentions in footnotes (which we were unable to remove from the PDF). Removing these left an adjusted count of 244 runaway ads in the Arkansas Gazette from 1835-1860. A similar search revealed the runner-up publications of ads to be 35 ads by the Washington Telegraph during this time, and 31 by the Arkansas Advocate. First, I removed the extra date headers by using the regular expression #1, posted as a gist on my github account. Then, I removed the page numbers by using regular expression #2. That’s when I started seeing some issues in how the text copied over from the PDF file I downloaded from the Documenting Runaway Slaves advertisement. As shown in the picture below, I discovered that every time a superscript (such as th, st, or nd) is used, the text does not copy over in the correct order. As you can see on line 342, the text abruptly cuts off right where the th superscript should be, and the rest of the text that follows is now placed on line 351. The superscript has been placed on line 341 (or line 347 — both contain “th”). The superscripts for numbers were not used consistently throughout the document, so it is not a consistent problem for all of the advertisements. It also poses more of a problem when we start using the advertisements for analysis. One other problem I discovered is that some of the dates in the [date Month year] format is that some of the lines end in a period, some do not have a period, and some have bracketed edited information. Therefore, I had to use regular expression #3 to figure out how many advertisements the document contained. I found 1633 matches, which was about four times as many as we found from Arkansas. I additionally used regular expression #4 to figure out how many advertisements we had from the period of 1835-1860, and I discovered 1060 matches. There possibly could have been a more effective way to do this, but I think I was able to find them all using that expression. I am still working on figuring out how to remove all of the footnotes. The footnotes do not seem to have any similarities between them except for a number at the beginning of a line, so it is difficult to remove them without removing advertisement information as well. Additionally, I will use ResoViz to see how many advertisements we have from each newspaper as Daniel did with the Arkansas ads, but because there are too many ads collected from Mississippi to analyze them all at the same time using Voyant, this task is taking longer than I originally thought it would. Over the weekend, I completed the “Intro to Google Maps and Google Earth” tutorial from The Programming Historian. I learned how to import a dataset into a layer on Google Maps. The tutorial used data about UK Global Fat Supply from 1896, and through changing the style of the placemarks, I created a map that colors the placemarks by what kind of commodity that region provided. 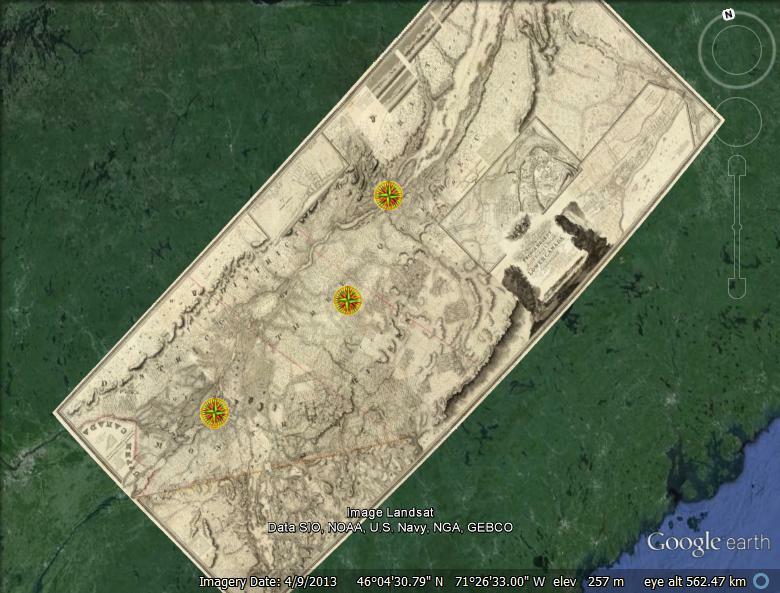 Additionally, I learned how to create my own placemarks, lines, and polygons (enclosed areas or regions) on Google Maps. Knowing how to create these vector layers could be important for our project because many of our historical questions deal with geography, such as the difference between the slaveholders’ “geography of confinement” versus the slaves’ “rival geography” (for a full list of questions, see our previous post about historical questions). However, it is more likely that we will be creating spreadsheets with the data that we will eventually want to use in a map, such as the location of the slave owner or the possible location the slave ran. Overall, Google Maps seems like a pretty simple tool for plotting locations or events. One of the main drawbacks of Google Maps, however, is that it can only import the first 100 rows of a dataset and only 3 datasets for a total of 300 features. It seems like we possibly have more data without narrowing the advertisements down than Google Maps can hold. The tutorial also let me explore some of the features of Google Earth. Google Earth has the ability to create vector layers like in Google Maps, but it also has more advanced features such as the ability to upload a historical map to overlay over a section of Google Earth. 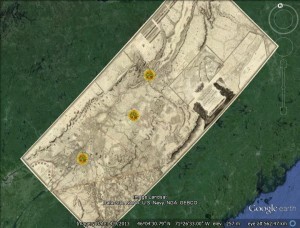 Google Earth has an interesting historical imagery view, which includes a sliding timeline bar that shows what a region looked like at a particular moment in time. Clare and I thought that we would be able to add placemarks with certain time stamps so that they only showed up at a certain point in time and then to animate the whole sequence. We tried valiantly to make it work, but the placemarks appeared regardless of which point in the timeline was selected on the timeline bar. At this point, without finding some sort of tutorial, I do not think we can go much further with animating placemarks on Google Earth. We do think that being able to animate points in time would be useful for us to look at many of our historical questions. Neatline, a tool of the online exhibit creator Omeka, would give us the ability to do this. On Wednesday, I would like to take a closer look at what Neatline and TimeMapper (another tool for making “time maps”) do to see if either is something that we might want to pursue. In addition to looking at these time mapping tools during class, I want to look back over the tutorial on thematic data maps to better understand how Google Fusion Tables works. I think that these tools dealing with geography will potentially be useful in analyzing or presenting our data because of the focus on geography that many of our historical questions have.